I think I caught CAT slowing down their phones! So back in December when I got the Android 8.0 update on my CAT S41, I noticed that GTA was a tad bit laggy. I didn't think of it very much and assumed it was a compatibility issues with the specific OS and GPU combo. Then today I decided to use 3DMark to see how my phone stacks up against current flagships. Before testing, I went to the database scores for my phone and was HORRIFIED (see screenshot below). Then I ran the test myself and got 88. I remember it being around 700 with 7.0, just like in the database info. What the hell is going on?! I highly doubt a small driver bug could cause this, especially since it only shows in one game (although the other games I play on my phone aren't that demanding). This looks like an attempt at planned obsolescence or something similar. Oreo brings Vulkan API's to the OS. What happens if you run the test on Vulkan instead of OpenGL ES 3.1? Although my phone has hardware support for Vulcan last time I messed around with some demos, 3DMark claims it doesn't support Vulcan. I have the Mali-T880MP2 (dual-core Mali-T880) and have successfully run other Vulcan stuff in the past. Interesting. I'm not familiar enough with the CAT S41, unfortunately, I was hoping we'll find an easy answer. I am interested to see what the explanation is. I tweeted to them yesterday and no answer yet. Will report back if they answer. I would absolutely agree if this was another OEM, but I see the CAT S41 is still one the top products from CAT, as of the time of writing this response, so I am not sure if this really is planned obsolescence? This could mainly have to do with poor driver support and optimization in the MediaTek Helio chip it is running, it is also quite an old chip now, built on a 16nm process it was not exactly cutting edge in its time (10nm was the best process in 2017) either, so this could be a combination of things going on. 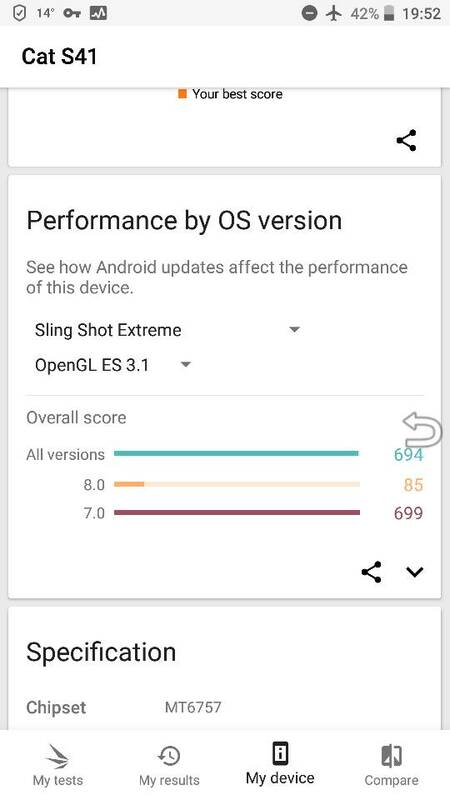 Android 8.0 does seem to be more demanding to, phones with +14nm chips are not exactly running Android 8.0 Oreo optimally unless they are rocking a Snapdragon 820/821. Maybe check at XDA Developers if the wizards there can help, but I get a feeling there is a variety of factors at play here. Might have to see if anyone on XDA has the same phone and an explanation for this. I now also highly doubt it is planned obsolescence (but when I noticed this I freaked out and thought it was). CAT IGNORED a tweet I sent 2 nights ago about this. Probably just a driver bug. It only affects 3DMark and GTA. Everything else works fine. If this is a GPU driver issue, wouldn't it affect all devices using Mali-T880 GPU cores? Didn't hear anything about Exynos S7 users crying about Oreo. I think I can live without GTA on my phone, especially since it is not the main device I play that game on. May be it has more to do with CPU than GPU? Very odd indeed, and you are right, nobody is really complaining on the S7 Edge with Oreo, the OS that was a problem on S7 Edge was Nougat, but Oreo fixed the issues Nougat brought. Hopefully someone at XDA can help. GTA does have its issues on Mali GPUs according to Reddit (and I haven't updated to the bug fixed version for reasons I can't talk about on this forum). What isn't excusable is the 8x lower 3DMark score, and CAT has been ignoring my tweet from last week. And to top things off, the Oreo update boosted the AnTuTu score by 3k points. And now for the CPU story. So the S41 basically runs its four 2392MHz performance cores at maximum or near maximum speed all the time. As for the four 1690MHz efficiency cores, those fluctuate Al over the place and slow down to idle when the phone is idle. Now comes the part about Sports Mode. Back on Nougat, enabling this would make the CPU favor performance over power consumption by keeping the efficiency cores at near max speed (this is all I could see, since I can't read GPU speed on this phone). This made the phone slightly snappier, made web browsing faster and also enhanced PC emulator performance. Best of all, it didn't have much of an impact on battery life if any at all. They sadly removed this in Oreo, but due to general optimization the update made the phone feel faster (several times quicker boot time, more responsive UI, etc...). CAT officials, on my request, talked to their dev team about this. The responses I was getting were all over the place, but at the end they said it wasn't possible to put the mode back. I never did a 3DMark test without sports mode on Nougat, but I do remember GTA working just fine without sports mode. And to top things off, GTA pegs all the cores at max speed the minute I open it, so definitely no CPU issues there. My phone (Galaxy S9) is also making calls on its own, while texting. help! What does the globe icon mean in the drop down of google search?